The “Diversifying the Federal Supply Chain Summit” is designed to increase diversity in the federal procurement supply chain. 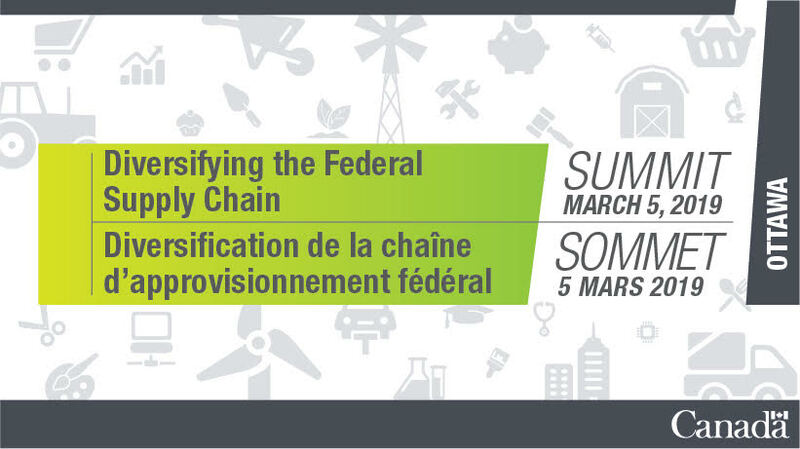 This event is focused on creating awareness of Government of Canada and private sector programming that can help women, Indigenous, minority, LGBTQ2+, and persons with disabilities owned businesses access federal contracting opportunities. Please provide the following information by e-mail at maria.colja@boa-opo.gc.ca or by telephone at 613‑947‑9717. Do you have any specific mobility requirements? If yes, please explain. Do you require assistance in the event of an emergency evacuation? If yes, please explain. Do you require documents in alternate forms? If yes, please identify the format you require. Will you be travelling with a personal support attendant or service animal? Is there anything else you may need assistance with for the event? If yes, please specify. Any questions can be directed to Maria Colja by email at maria.colja@boa-opo.gc.ca or phone at 613‑947‑9717.